We will mail a tract to your loved one. Is there someone you are praying would get saved, but they seem to be unapproachable with the Gospel? We have heard many prayer requests for the Gospel to be sent to a lost loved one in need of Christ. We firmly believe in the principle of Isaiah 55:11, "So shall my word be that goeth forth out of my mouth: it shall not return unto me void, but it shall accomplish that which I please, and it shall prosper in the thing whereto I sent it." With that verse in mind, if you will provide their address, we would like to send your loved one a tract in the mail so they may receive the Gospel. Tracts will be sent anonymously to the addresses submitted, believing that the Lord will use it to plant a seed, that one day they will accept Christ as their personal Saviour. Send us your name and email so that we may let you know that the tract has been mailed. Your name will not be disclosed unless we are told to include it. 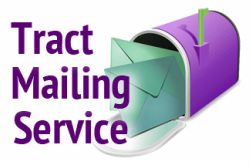 The tract recipient will only see a return address to a P.O. Box. Should we receive an feedback from the recipient that you have sponsored, we will forward that information on to you. We are praying that God uses this method in a great way. He promises us that His Word will not return unto us void. What might happen if you sent a tract to your loved one? Copyright © 2016 Delight Thyself Design Ministries, Inc.